Once the lockout ends, Kevin Kolb could be one of the hottest commodities in the NFL.The Arizona Cardinals came away from the 2011 NFL draft with eight prospects, but none who play quarterback. Arizona finished 2010 with just 10 touchdown passes, second-fewest in the NFL, among three different starting quarterbacks. Many were left wondering: in a draft which saw six quarterbacks taken among the first 36 picks, why didn't the Cardinals take one? Earlier today, John Clayton wrote that the Cardinals may have other ideas and will likely end up "moving boldly" to acquire Kevin Kolb from the Philadelphia Eagles. 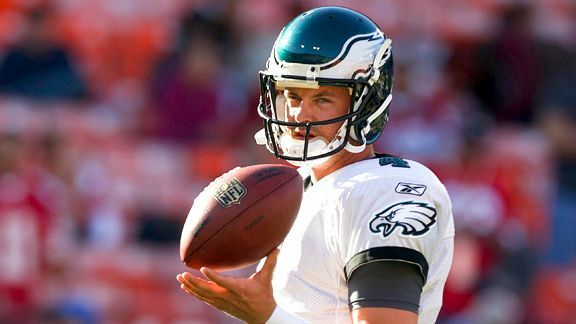 What the Cardinals and other quarterback needy teams have to ponder is this: Is Kolb worth the bold move? A second-round draft pick of the Eagles back in 2007, Kolb has three more interceptions (14) than touchdowns (11) and a 73.2 passer rating in 319 career attempts. Drawing conclusions from numbers that equate to about 70 percent of a season for the average starting quarterback is unfair, but let’s dig deeper. Quarterbacks get paid to move the chains on third down and those situations have been a struggle for Kolb. Of his 75 career pass attempts on third down, 19 have been scouted as defensed. That equates to a near-interception every 3.9 pass attempts on third down. His troubles on third down are closely related to Kolb's splits against base defenses versus the defensive packages featuring more than the usual four defensive backs that are more commonly seen on third down. Dating back to 2008, the average passer rating for NFL quarterbacks against those small packages is 79.6. Kolb’s passer rating against five-or-more defensive backs over the last three seasons is 66.4. That puts him in the same company with guys like J.T. O'Sullivan (66.0), Dan Orlovsky (64.1) and former Cardinal Matt Leinart (68.0). Kolb will only see more and more of those looks as his career progresses because that’s the direction the league is headed. Quarterbacks saw opposing defenses line up at least five defensive backs on 48.5 percent of plays last season, up from 44.9 percent in 2009. That’s especially scary for a team like Arizona that heavily relies on pass-heavy sets that dictate that defensive look. The Cardinals' offense faced a secondary with at least five members on 54 percent of plays last season. Defensive coordinators generally like to send five-or-more pass rushers at inexperienced quarterbacks looking to force mistakes. The good news is that Kolb began to improve against added pressure in 2010. While facing five or more pass rushers, he completed 25 of 41 passes with a touchdown and no interceptions. From 2008-09, he barely completed half his passes (52.9) and had two touchdowns and seven interceptions. They aren’t meaty sample sizes but they do illustrate the type of growth that teams look for.